2 hair flowers/ flower hair clips with 1 large african daisy flower and a gold belly dance flower button each, attached to professional metal hair clips for very strong hold (minimum hair length: 5 cm/ 2 inches). 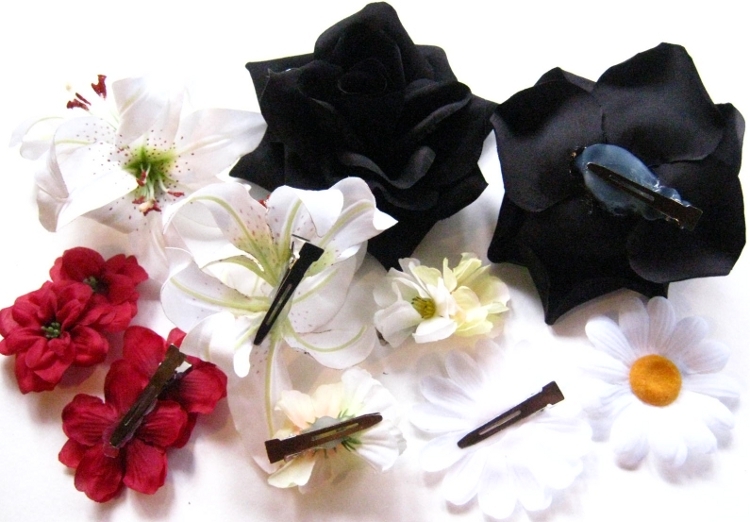 These flowers are made of soft plastic and not of fabric like our other hair flowers. Still they do look natural! These daisies match many styles and are wonderful for formal occassions like proms and weddings and for alternative outfits like fantasy, tribal fusion belly dance, boho & gipsy style and Goth & cyber looks, too!